The third edition of this valuable handbook is now available. 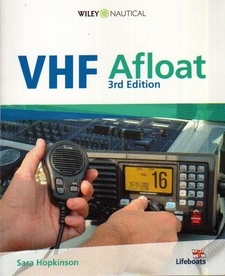 The layout is clear and simple to follow in a book that will serve as an essential primer to those intending to take the VHF radio operator’s examination and for those who already hold a certificate. In several important respects, VHF marine radio has changed little since it first became available but there have also been many significant changes. The channels and frequency range remains the same and the voice procedure remains essentially unchanged. The range of transmission will be much as for the first vessels to be equipped with VHF radio telephones, being limited primarily by the visual horizon from the position of the antennae. For two yachts attempting to communicate in heavy weather, this means a very limited range. Maximum range will be from a yacht to a shore station that is equipped with a radio mast on land well above sea level. What has changed greatly is the design and construction of shipboard radio equipment. It is smaller, consumes less power and is intelligent with a frequency generator in place of the original crystal controlled channels. The author has given a comprehensive guide to the use of modern marine VHF radio and also covered the more recent radio innovations that change the way sailors use VHF. Today a sailor is likely to have a mobile telephone and may have a satphone. Provided that the sailor is in range of shore-based cellular phone systems or satellite constellations, these systems provide a very effective communications environment that allows the congested VHF channels to be avoided and provides significantly greater range and functionality. In approaching marinas, and operating on inland waters, there is now also a choice of using citizens band radio that again relieves the demand for marine VHF channels. In addition to these systems that were originally developed for land mobile communication, the sailor now has a number of other radio systems that replace or enhance VHF radio. EPIRB emergency beacons and SARTs search and rescue transponders provide an accurate alarm and position system that avoids the need to stay as long as possible with the VHF radio sending MayDay calls. There are also navigation systems that replace the use of VHF radio including NAVTEX which an English language information service to sailors. The author has covered these new systems and the ways in which they help all sailors to make more effective use of marine VHF radio by providing new functionality or removing the need to transmit on VHF. This book is essential reading for every sailor.